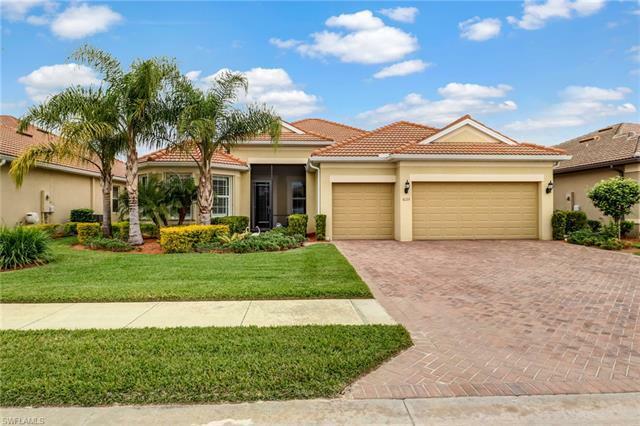 No expense spared in this Gorgeous Dunwoody Trail Model, Pool home with amazing views of the 18th hole.This 3 Bedrooms, with Den, 3 Full Baths, 3 Car Garage open floor plan is located in the award-winning Del Webb 55+Community in Ave Maria. This home has electric roll-down lanai shutters & accordion storm shutters on all windows, plantation shutters, Gourmet Kitchen, Stainless Steel Kitchen Aid Appliances, Vented Hood, Granite Counter Tops, under Cabinet lights, Tile floors, Crown Molding, 8â Interior Door, Laundry Room, and Decorative Light Fixtures. Master bedroom has walk in closet, dual sinks and huge walk-in shower. Owners have access to The 12, 000 sq.ft Oasis Club Resort Amenity Center â Activities Director, Semi-Private Championship Style Golf Course, enjoy the 8, 000 sqft. Resort Pool, Rusty Putter Bar & Grille, well-appointed Pro Shop, pickleball courts, bocce, tennis, Happy Hour, Dancing Classes, movie nights & more!